and manage web forms and surveys in a breeze. Already a member? Get in and see what’s new! You too can build up your business using forms. After the initial feedback gathering process, go beyond the data to win over your customers. Create services and products based on the actionable data received through your forms, surveys, tests, and polls. Designed to make form creation a lot easier. Create forms and surveys without writing a single line of code. All elements, buttons, fields, settings and instructions are already available in your Form Builder, just drag them where you want and adjust as necessary. For those who need quick solutions, we’ve designed more than a 100 templates to fit any purpose. 600 actual users helped us design the most logical flow. Together with our users we designed the best experience for you. Sidebar navigation is one of our favorite interface improvements. Now you can locate all important app sections in the upper left corner of your Form Manager. It's out of your way while you're working and you can access it easily in one click when you need it. All form functions conveniently located in one neat dashboard. Access entries, sharing options, form rules, notifications setup, payment integration and usage reports on the dashboard. Functions like SSL encryption, password protection, form visibility and themes are at your fingertips. Single page for all your forms. We’re done with pages! Now you can scroll infinitely through all your forms and surveys to quickly find the ones you need. Use bulk selection to move, delete, or tag multiple forms at once. Switch easily between thumbnail and list view. Innovative way to organize your forms. Assign one or multiple tags to each form and it will be automatically added to your label folders on the left. You can even mark multiple forms and tag them all at once. Find all your forms sorted out under their labels or use the powerful new Search option. Get precise insight into your forms’ performance. Form Manager 2.0 comes equipped with a handy new feature that lets you explore the performance of your forms, surveys and tests. You can now track the activity to see how many Views and Entries they receive on a daily, weekly, monthly and yearly level. Give it a FREE Try! Create and manage unlimited forms and surveys for free forever. surveys, opinion polls and more. Send customers your form’s URL in an email. Publish on the web by embedding a single line of code. Integrate with social media. Create forms, surveys and tests from scratch using an agile interface with a variety of ready-made fields and functions. Or choose a template to optimize, adapt and adopt. Access data and sort entries in a simple dashboard. Calculate percentages and stats based on the data pulled from your forms, surveys, or tests. To achieve more conversions make your forms and surveys visually attractive. Apply our existing themes or create your own branded designs. Take your form fillers by the hand and lead them wisely through the maze of survey questions and answers. Create logic paths to condition your forms' behavior based on user input. Build automatic reports to organize form and survey data visually (percentages, stats, charts, tables). Export or share with your team internally. See what more our forms surveys and polls can do. No guessing, feedback is the king! Our users directed, we executed. The results were amazing. Looks great, being organized always helps in being more efficient. Can't wait until it's rolled out. Thank you for your product. It looks attractive! I hope that the way to use the program will be as easy as before. Much superior to the pages. Very good indeed. Changes seem easy enough to use. Hopefully it'll be easy to work the new features after a bit of playing around. 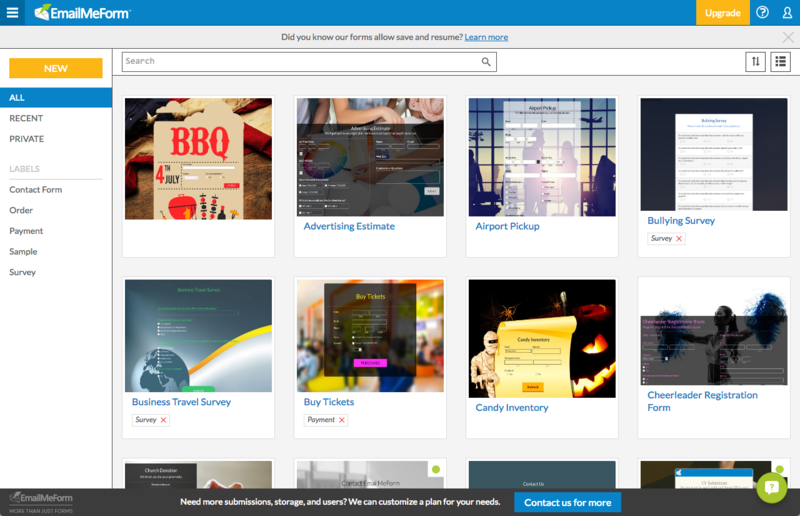 According to our users, new Form Manager is more attractive, organized, and productive. Start creating your forms surveys and tests for free and get actionable data for your business. Copyright © 2006-2016 EmailMeForm™ LLC. All rights reserved.